$161.99 plus free ground shipping anywhere in the US. 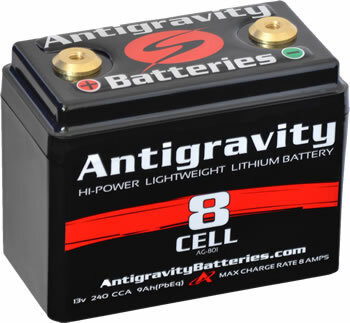 The Antigravity Batteries AG801 8-Cell Motorsport batteries is one of the most popular models. This battery offers extreme power in the most compact size in Lithium Motorsport batteries. This battery is best used for applications where extreme weight loss and ultra compact size are desired and can be used for bikes from 600cc street use and 1200cc race use. ADHESIVE BACKED FOAM INCLUDED IN BOX FOR EASY INSTALLATION.